Download and print these free consent cards for your movement classes. 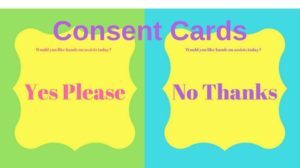 These consent cards are simple flip cards that each student places on their mat either in the Yes or No position to indicate their wishes to receive or not to receive hands on adjusts or assists during a movement class. Consent cards work to ensure that those who don’t wish to be touched (for any reason) can have their wishes respected, while those who love to be touched can enjoy some hands on support and guidance during class. 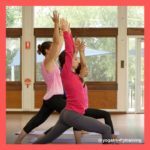 With an increase in awareness of the use of touch in yoga and movement classes, the consent card is a simple but powerful tool to re-establish the awareness in class that each student can choose how to move their body and every student has a right to choose when/how/or if they wish to receive hands-on assistance in movement. Something that I personally love about the consent card – being wary of technical adjusts that might upset my tricky back, but loving a bit of end-of-class massage – is that they can be flipped to yes or no at any point in class, so if someone (like me) doesn’t want technical adjusts during practice but would love a shoulder press or neck sweep before Savasana, they can tell you about it simply by flipping their card. I’ve made some simple cards below for my own classes – feel free to copy, print and share these free consent cards for your own movement classes today.